All of us here at Comic Art Community are hoping the legendary Bernie Wrightson‘s fall was not too bad and that he has a speedy recovery. Some of you may know he is one of my all time favorite artists. 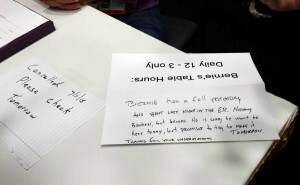 This note was found on his table today. If anyone is there and can verify this or update me, please do.